A new library will be built next to a refurbished city hall and council chambers building. SPRINGVALE’S civic centre and meeting rooms will be retained but its administrative offices will make way for a plaza and new library under a council masterplan released late last year. 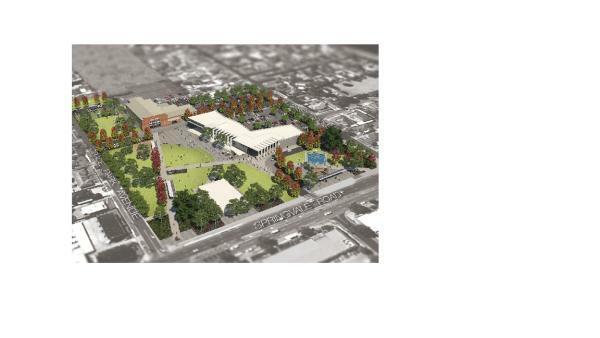 The civic precinct project is not expected to be completed for another 10 to 15 years. Councillor Sean O’Reilly said the “early” masterplan release would allow the council to start small parts of the project in the short-term. It would also make the project more attractive for state and federal funding, he said. The council is “stitched up” in loans for the Municipal Building Project in Dandenong, leaving no room to borrow for the $35-45 million Springvale project until 2017. The planned sell-off of the former council depot site would not be enough to offset the project’s cost. Cr O’Reilly said the prospect of state and federal funding was “highly variable”. In the meantime, there may be “smaller works” such as a Grace Park Avenue playground and converting the site’s “underutilised” open space into parkland, Cr O’Reilly said. In the 2013-14 mid-year budget, $50,000 was allocated for improving the site’s City Hall sound system. During community consultation, there was strong public support for parks and open space on the site. The council plans to retain and refurbish the city hall and supper room, retain the council chamber building for community meetings and council customer service and to build a larger, modern library and community building. Cr Roz Blades said she was pleased with the retention of most of the buildings as well as the extension of open space. The “best-of-the-best” library was recognition that the existing library was one of the state’s busiest, she said. She hoped the facility would include child care and more computers and technology for students. The council’s administrative building, to be vacated early next year, will be demolished. Plans for community groups to use the office space prior to demolition are uncertain. Cr Peter Brown said local groups were expecting the council to pay for refitting and subsidising the building’s substantial heating costs, which was “not shaping as cost-effective for the council”. Cr O’Reilly said the project signalled the council’s “commitment” to investing in parts of the municipality outside Dandenong. He said there was an urgent need for more public transport, child care and family services in Keysborough which is projected to increase by 20,000 residents – double its current population – over the next five years.